This easy appetizer recipe is completely unsponsored….just sharing my love of blue cheese and bacon! I went to a friend’s birthday party this weekend and was asked to bring something to share with the rest of the group. I love going places where I am asked to cook something…it gives me a chance to play around with new recipes and get other people’s opinions of them. This blue cheese and bacon dip seemed to be a big hit with my friends. Blue cheese is not something my husband cares for so I don’t buy it very often but I absolutely love it! And paired with bacon this dip was deliciously creamy and decadent. Definitely NOT all too healthy but sometimes you just need to enjoy your food without worrying about whether it is good for you or not! I don’t usually buy a lot of bacon but when I do I always look for local or sustainably raised options. You can check out Applegate or look at your local Whole Foods Market. If you are looking for an easy appetizer recipe for a party, this one is a good choice! If you would like to see the original recipe check out MyRecipes.com. 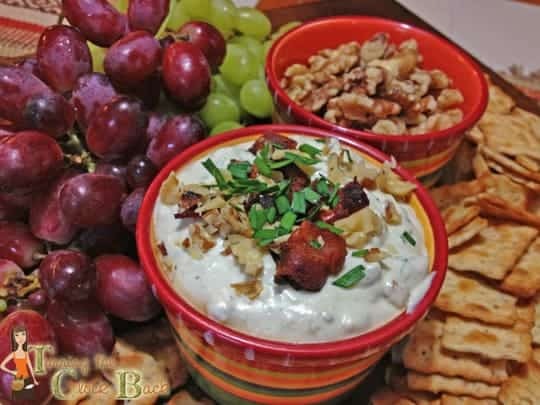 This easy appetizer recipe is creamy and flavorful with chunks of blue cheese and bacon. In a frying pan over medium heat cook the bacon until crisp. Drain on paper towel and crumble. Set aside 2 TBSP for topping the dip. Leave about 2 to 3 TBSP bacon grease in the frying pan and saute the minced garlic 2 to 3 minutes or until just starting to turn golden. Remove from heat. In a large mixing bowl beat the cream cheese and half and half until smooth and well blended. Put dip into an oven proof bowl with lid and heat in the oven at 350 degrees for 20 to 30 minutes or until mixture is bubbly. Stir occasionally. Remove from oven and sprinkle with remaining bacon, chives and walnuts. What’s your favorite easy appetizer recipe for sharing with friends? That looks like it would be so delicious with hot wings! Mmm this sounds so good. Anything with bacon is my friend. Oh my goodness, this sounds amazing. I love, love, love blue cheese and adding bacon, is just the icing on the cake! everything is better with bacon! I am going to eat the leftovers for a very unhealthy lunch! You had me at "blue cheese and bacon". I would eat this on cucumber slices and with other raw veggies. DELISH! I absolutely love blue cheese & thankfully no one else in my home does so it's all mine!